Today's crocodiles are mostly large reptiles are adapted to a semi-aquatic existence. This was not always the case. In fact the crodylomorph group began as small, gracile terrestrial predators. Crocodile scales are hard and square, and a few rows of raised scales down the back and tail contain knobs of bone. 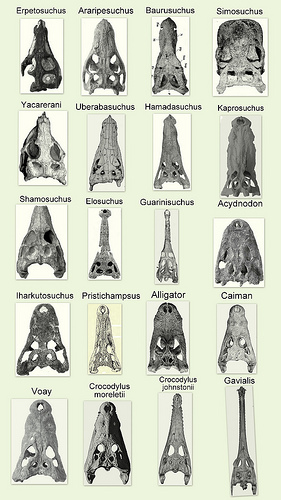 Every bit as old as the dinosaurs, to which they are fairly closely related, the crocodiles and their early predecessors (collectively, "Crocodylomorpha") are an ancient and venerable lineage of archosaurs. Although typically reptilian in their scaly integument and "cold blooded" (ectothermic - actually inertial homeothermic in large forms) metabolism, they nevertheless display advanced chracteristics such as a four-chambered heart (in efficency similiar to the bird and mammal heart) and maternal care of young. During the late Triassic and early Jurassic these animals were mostly small, graceful, active terrestrial forms, quite unlike the way we think of crocodiles today. After flourishing for some 40 or 50 million years - almost as long as the age of mammals - these small active animals died out, either through competition with small theropod dinosaurs, or perhaps through a mass extinction e.g. the Toarcian turnover that also eliminated the Prosauropod, Podokesaur and Heterodontosaur dinosaurs and a number of lines of marine reptiles and invertebrates). The surviving crocodilians were larger animals, more like the crocs we know today, but, curiously, mostly marine. Later in the Jurassic, these marine forms invaded fresh water and swamp environments as large semi-aquatic predators, and finally returned to the land again as small forms. It was as large, semi-aquatic predators that they became most successful. Crocodiles are superbly adapted to life in rivers and swamps. A fold of skin closes the windpipe at the back, so that the animal can open its mouth under water and breathe with only its nostrils above the surface. The nostrils, like the eyes and ears, are placed high on the head. When crocodiles are completely submerged, the ears and nostrils are closed by valves, and the eyes covered by membranes. Crocodiles have no salivary glands and usually eat under water. Some species sweep their prey from the land into the water with their powerful, vertically flattened tails, a technique that was almost certainly also practiced by Phytosaurs of the late Triassic. The warm balmy Mesozoic climate was kind to these prehistoric reptiles, and they flourished and diversified for many millions of years, attaining world-wide distribution. The larger semi-aquatic types lunched on dinosaurs and large lungfish and Lepidotids. Some, like the great Sarcosuchus and Phobosuchus, reached huge size, 10 to 15 meters in length and some 8 to 15 tonnes in weight, bigger than the largest T. rex. Perhaps because of their ectothermic metabolism (which makes it possible to go without food for long periods) and their reliance on the fresh water carrion - detrivore foodchain, rather than the ocean plankton - based or the terrestrial plant - based foodchains, the crocodiles were unaffected by the comet/asteroid - impact end-Cretaceous mass extinction that eliminated most forms of life on Earth. They continued through to the Paleocene, and in the absence of large competitors evolved into large fully terrestrial preditors (Sebecosuchids, Pristochampsids).